A 60 minute in-school presentation that uses music and story telling to spark interest, ignite change, and fuel passion while recognizing positive leadership efforts of our nation’s youth! Particular emphasis given to selfless, community-minded behavior that helps others; essentially, PLAYING IT FORWARD! Tenille, has just wrapped her cross-Canada Play It Forward tour where she spent a total of 32 weeks on the road, visiting 106 schools and performing for over 35,000 students. The tour incorporated the young Country singer’s music and motivational speaking for students in schools across Canada, promoting positive leadership efforts for youth. Announced at the Play It Forward wrap-up concert in Grande Prairie on December 14, 2013 grade eight student Lauren Seabrook from Yellowknife has been selected out of 309 recognized student leaders and awarded $10,000 to put towards a charity of her choice and an in-school community program. Tenille’s ultimate goal is to make a difference with her passion for music. The 2012 & 2011 Alberta Country Music Association Female Artist Of The Year. Youngest ever recipient of the 2012 CCMA Slaight Music Humanitarian Award. Grande Prairie & District Chamber of Commerce – Business Excellence Award for Young Entrepreneur of the Year. Youngest ever Canadian Country Music Awards nominee for Female Artist of the Year in 2011. The future belongs to youth who believe in their dreams and have the ambition to make them reality. Today’s youth hold the opportunity to prove that passionate actions can truly make a difference!! During the show, she and staff members of the school will call 1-3 pre-determined leaders out of the student body who will be recognized for their actions during the presentation. Each leader will receive $75 – this money is to be played forward to their school however they see fit! They will also be entered to win the mass draw at the end of the tour for the $10,000 prize package. $5000 of which is donated to a charity of choice the chosen leader is passionate about, and the other $5000 going towards the school of the drawn leader to be put towards a program that continues to play it forward through their hallways! More exciting surprises are in store at each visited school…. Tenille is paving her own way in this business of country music in Canada. As we’ve watched this young aspiring artist, grow before our eyes into a young woman, Tenille is quickly becoming a role model to many and has an infectious way of inspiring everyone she comes across, with her contagious smile and uplifting attitude. Tenille embarked into 2013 with single “Dear Heart” which received great reviews, entered top 100 on Trax and is currently in high rotation on the Family Channel. Late summer, Tenille released her highly anticipated 3rd single “Halfway To Somewhere” off of her new album “Light”, a great departure from her previous release, introducing us to a wiser and more grown young adult. This album gives us insight to the trials and tribulations of a teenager facing growing into a woman, falling in love and being carefree with your heart. Tenille is known for her philanthropy contributions, which resulted in being honoured as the youngest recipient in history to be presented with the Slaight Music Humanitarian Award at the 2012 Canadian Country Music Awards. In 2012 Tenille was also recognized by the Grande Prairie & District Chamber of Commerce – Business Excellence Award for “Young Entrepreneur of the Year” and recently in early 2013 received the Queen Elizabeth II – Diamond Jubilee Medal. Following this great honour, Tenille also received The Alberta Country Music Association’s Award for “Female Artist of the Year” for the 2nd year in a row and also was awarded with the 2012 “Fan’s Choice”. September 2013 Tenille received a CCMA nomination for “Interactive Artist of the Year” and most recently won The 2013 ACMA “Fans’ Choice” Award. Tenille intends to use her developing career and notoriety to continue to give back through music to communities across Canada. Grande Prairie’s starlet is setting her mark on country fans and industry alike with her strong advocacy for ‘giving back,’ with heavy fundraising efforts with several organizations and in addition, to creating her own annual music event Big Hearts for Big Kids benefiting Sunrise House, the youth emergency shelter serving a wide area of Northern Alberta. In the four-year event tenure, $350,000 has been raised which helped to keep the shelter doors open. 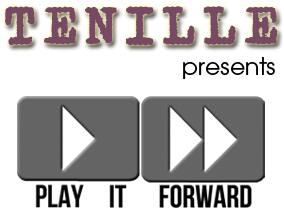 In addition to being busy finding ways to “give back”; Tenille started her own headlining tour, called “Play It Forward”. This tour kicked off in her home province of Alberta in October 2012. Tenille traveled to schools across Alberta with a message through music and motivational speaking for students, promoting positive leadership efforts for Canada’s youth. During the 5-week duration, Tenille managed to reach over 10,000 students in 29 schools all over the province. With Alberta being such a great success, the nation wide tour started for 12 weeks in March and continued to June of 2013 from British Columbia to Ontario. The remainder of this tour is now in progress, which headed out on September 11th to Yellowknife and then continued east to Ontario. The tour is currently working its way through the Maritimes for a duration of 14 weeks ending the 1st week of December. Tenille has been fortunate to land opening slots for well-known acts including Terri Clark, Randy Travis, Easton Corbin, John Landry, Aaron Pritchett, Emerson Drive and Gord Bamford. She has performed at some of Canada’s biggest country music festivals including The Calgary Stampede, Big Valley Jamboree, Manitoulin Country Fest, Bud Country and heard across the country on Breakfast Television Edmonton, CTV’s national morning show and Canada AM. Signed to Royalty Records in 2011, Tenille released her sophomore album on March 12th, 2013 entitled “LIGHT”.